Forest Whitaker stars as the brilliant jazz saxophonist Charlie Bird Parker in this elegiac biopic. Director Clint Eastwood pays full homage to Parker's musical genius, but also devotes ample time to the musician's twin demons--drugs and alcohol-which accelerated his death at the age of 34. In his struggles to gain widespread acceptance for his music, Bird is forever stymied by his own self-destructiveness, and forever bailed out by the love of his life, Chan Richardson Parker (Diane Venora). The film bemoans the decline of the brand of jazz fathered by Parker, which came to be replaced by more conventional material -- as illustrated by the descent into the mainstream of Parker's mentor Buster Franklin. Also starring in Bird is Samuel E. Wright as Dizzy Gillespie. 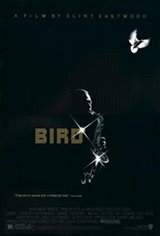 That's the real Charlie Bird Parker on the film's soundtrack, though most of the background music has been re-orchestrated.